Diptyque Violette Perfume by Diptyque, Part of Diptyque’s home fragrance collection, Diptyque Violette is a delicate scent that you are guaranteed to love. This romantic fragrance is perfect to freshen up any room. It is a unique take on the classic violet scent and is a blend of violet flowers and Virginia cedar wood. This subtle fragrance is light and pleasing. This dreamy aroma will invigorate your olfactory senses. Refined and charming, violet is a traditional favorite of Persians, Romans Read More Read More and Greeks. The sweet floral scent matches any mood or season. This candle was made with natural raw ingredients to maximize its life. It can burn for up to 60 hours. 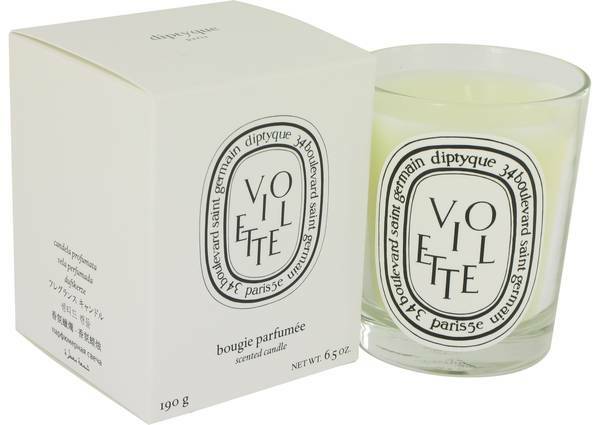 Diptyque is recognized internationally for its vibrant collection of home fragrances, candles and body care. The company began as a small storefront bazaar run by a trio of creative minds. It has since blossomed into a world-renowned business that hopes to spread the use of natural fragrances. All products are original, authentic name brands. We do not sell knockoffs or imitations. Derek Lam 10 Crosby Silent St.
Quick shipping. Satisfied with order. Received sample fragrances - I love free stuff!